It did not really save me time as I waited in the wrong line even after asking the staff where I should present my ticket the entrance is the to far left, there are 2 lines. I was there in the busy season and the line was not crazy long. I suppose it was good to have but I am sure I paid more as opposed to just buying tickets straight from the museum. The museum is amazing though! 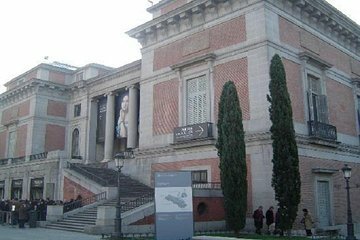 If you are familiar with the museum this is a great way to visit El Prado on your own, specially on a busy holiday. Skip the line and just walk thru security. This was great as the queue even at 10:00am when the Prodo opened was down the around the corner. We were able to enter without having to queue to buy tickets and went straight in. So much to see and as the day went on the queues got longer so I would suggest you get there early. The museum is totally amazing. A must see for anyone visiting Madrid. Thanks to buying the tickets from Viator, my wife and I were the first in when the Museum opened at 10:00 AM. The Prado is almost without parallel as a museum. The ability of the Spanish kings to collect European art and thus preserve it for our generation is something to behold. The collection is so extensive that there must be something for every taste in painting and sculpture too, if we had the time and energy to absorb that too. The Prado is one of the worlds great art galleries we went to see Hermonius Bosch and were not disappointed. I went here because it is the most famous ... but I recommend going to the Reina Sofia Museum if you're not a super big art person. I enjoy art but I'm not an expert, and the Prado museum has very old art - from highly Spanish skilled artists however it is a lot of the same style throughout the museum. I learned afterwards that the sofia museum has Picasso and its more of a modern art vibe which I would've enjoyed more. But for what its worth, it is worth it to buy the tickets ahead of time because you skip the line. So if you know what kind of art the Prado has and want to go, buy a ticket online first! Everything went very smoothly and lovely, with no time wasted. One of the best museums we visited. Very large, beautiful museum. Easy to get to via wonderful Metro system in Madrid. Don't miss this one and allow time to see as it is very expansive. We spent 3 hours and could have spent that much more time if we'd had the energy. Definitely buy skip the line ticks.